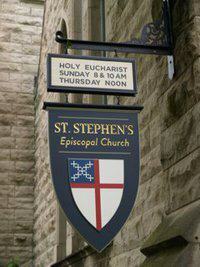 St. Stephen’s is proud to be a historic parish. We have been part of the city of Terre Haute since the 1830s, and our current building is the oldest in continuous use in the city. The following is a very brief sketch of our past two hundred years. We look forward to many more years of serving God and our community together. The Rt. Rev. Jackson Kemper, missionary bishop of Missouri and Indiana, included in his address to the second annual convention of the Indiana diocese the fact that he visited the new town of Terre Haute “during the fall of 1835” and “again in January and July, 1838.” Addressing the third annual convention of the diocese, Bishop Kemper said, “Friday night, July 16th, 1839, I officiated at Terre Haute.” Parish historical files contain a letter from a church member in Vincennes that Bishop Kemper carried as an introduction to the people of Terre Haute in 1838. The Rev. Charles Prindle began missionary work in Terre Haute on November 10, 1839. The cornerstone of the present church building at the corner of Seventh and Eagle Streets records that the parish was founded in 1839. The official meeting for organizing and naming the parish occurred on April 15, 1840, at the home of Levi Warren. Present were Thomas H. Blake and William F. Krumbhaar, who were elected wardens, and Levi Warren, Jacob Bourne, Richard Blake, W.L. Stone, John Rutledge, L.O. Shultz, Jonas Warren, G.W. Langworthy, and the Rev. Charles Prindle, who had been at work here as a missionary since the previous November and who would be named rector of the new parish two months later, on June 15, 1840. During the ministry of the Rev. Robert B. Croes (September 1842-June 1850), the first St. Stephen’s church building was erected between Main (Wabash) and Cherry Streets on the west side of Fifth Street. The cornerstone was laid January 1, 1845, and Bishop Kemper consecrated the building on October 2, 1845, during the first meeting of Diocesan Convention in Terre Haute. The basic structure of the present church building—nave, transepts, sanctuary, and sacristy—was begun in 1862 and completed in 1870. Services were first held in our building on March 8, 1863—in the middle of the Civil War—although work continued well into the next decade. The bell tower was added in 1874, and the great bell was placed in 1884. 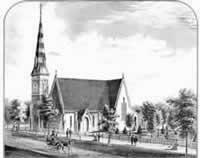 In 1885, during the tenure of Rev. Walter Deladield, a rectory was constructed on Seventh Street immediately south of the church. In 1891, during the rectorship of the Rev. James D. Stanley, the building expanded to include the Great Hall, Cloister Room, choir room, vesting rooms, and kitchen. The original building was a brick structure created in the Gothic Revival Style, a Victorian-era reinterpretation of medieval styles and techniques. Gothic Revival architecture features steeply sloped roofs, ribbed vaults, pointed arches, and a general emphasis on height and light—all of which you can see in St. Stephens. The English Arts and Crafts movement founded by William Morris, which stressed handcrafted work and objects from the medieval period—including stained glass windows—also influenced Gothic Revival design and the ongoing design of St. Stephens. 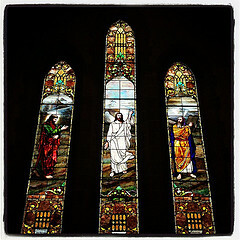 It’s important to note that St. Stephen’s involved itself with more than building projects during these growing years. Mission churches, notably St. Paul’s and St. Luke’s, were established by the parish in the 1880s and continued until the early 1900s. In 1923 the parish would aid in the founding of St. George’s Church at Ferguson Hill, West Terre Haute. The next significant expansion occurred in 1957-1958, when the Rev. Thomas Mabley was rector. The rectory was removed to make way for a new building containing the chapel, parish offices, rector’s study, Jackson Kemper room (a parlor-like room), nursery, library, undercroft, and several multipurpose classrooms and meeting rooms. The cloister porch and formal garden were also created at this time. These renovations completed the present St. Stephen’s complex, with the church on the north, the chapel-education-administration building on the south, the Cloister Room, cloister porch, and Great Hall on the east, connecting the other two buildings, and the garden nestled in the “U” formed by these buildings. In the 1960s, during the tenure of the Rev. Harold Taylor, the interior of the nave and transepts was completely redone—new floors, walls, ceilings, lighting fixtures, and window wells—following a fire. Exquisite polychrome work was applied to the beams and arches following thirteenth-century design concepts. At that time the altar was moved westward, and the organ console and choir were located behind it in the apse. A polychrome screen (now at the west end of the nave) separated the choir from the altar and the nave. The 1870s-era pews were replaced with wider, more comfortable ones and a center aisle was created (previously there were two aisles and three sections of pews). Also during this time, members of the parish helped with construction of three seven-foot chandeliers in the great hall, designed after a chandelier in St. Mary’s church, Bridgewater, England, and featuring shields of the saints. Large carved polychrome shields of St. Stephen and other saints are distinctive decorative features on the walls of the Great Hall. The early 1970s saw yet another project during the rectorship of the Rev. Joseph Rickards. At that time the white marble altar was returned to the east wall and covered wooden altar set in its place so that the celebrant faced the congregation—a “temporary” arrangement that would stay in place for the next forty years. A seventeen-foot coronation tapestry dossal was hung behind the marble altar and an eight-foot, hand-carved wooden cross suspended in front of it. An alternate arrangement allowed the removal of the dossal and wooden cross to show the window in the east wall. The organ console and choir were moved to their present locations in the north transept. A new gothic-style altar rail, executed in walnut, was installed. 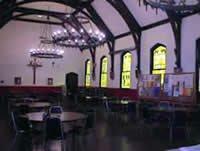 Marks of the 1982 restoration project are the paneling in the cloister room, a new paint scheme and lowered ceiling for the kitchen, and a number of improvements to the Great Hall, including a deep red wainscot topped with a gilt gold band, vesting/meeting rooms at the north end, and new lighting, tables, and chairs. In 1982 the vestry chose to rename the formal garden “in Thanksgiving for the ministry of the Rev. Thomas Mabley, rector of St. Stephen’s 1940-1960, and his wife Clara Clara Batjer Mabley.” Mrs. Mabley participated in the dedication service for the Mabley Garden in April of 1982. 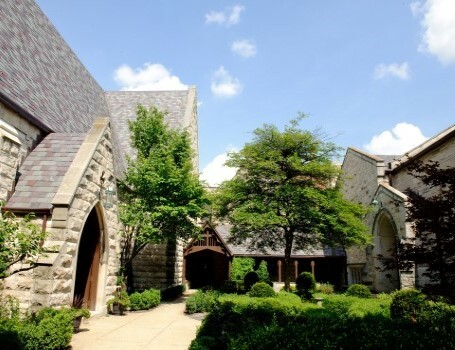 The garden, now a landmark of downtown Terre Haute and a source of tranquility for members and passersby, also serves as a memorial garden where the ashes of parishioners are interred. During the 1990s, when the Rev. Joseph “Chip” Chillington was rector, members of the parish renovated and redecorated the nursery, church school classrooms, and the chapel. Work done in the chapel included replastering, painting, cleaning, redesigning the altar area, refinishing the cork floor, and a new altar pulpit and altar rail. In May 1999, the Rt. Rev. 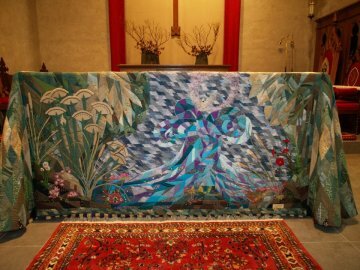 Catherine Waynick consecrated the restored and redecorated chapel. Renovations during the 2000s included a complete overhaul of the electric and climate-control systems, addition of a handicapped accessible restroom in the Great Hall, waterproofing of the basement, remodeling of the kitchen, and most significantly, replacement of the hundred-plus-year-old Vermont slate roof. 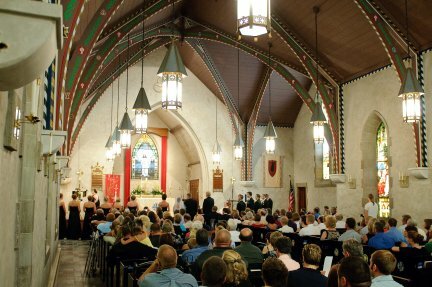 The new roof was a miracle story for the parish, which had long been aware of the need for a replacement but had not yet been able to raise the funds. Just as the need grew critical, in the summer of 2008, a hailstorm damaged the old roof. Church Insurance declared it a total loss and paid most of the cost of a new slate roof. 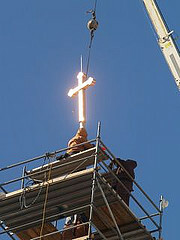 Parishioners funded the copper cladding for the steeple and a sh iny new copper cross atop the steeple. The weathervane that once topped the steeple was moved to the garden. In thanksgiving for the circumstances, parishioner Gene England penned this “roofing hymn,” which was actually sung in Sunday worship. 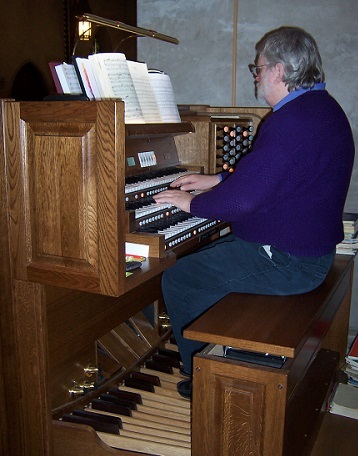 Replacement of the ailing Rodgers organ was also an oft-postponed improvement until parishioners Trisha and Bill Eccles donated a three manual Rembrandt electrical organ built by Johannus Orgelbouw of the Netherlands. The new organ began service in September of 2009. 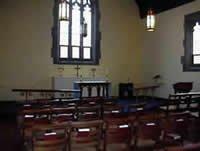 In 2010-11 the sanctuary area was renovated yet again. Parishioner John Salamone wove a wheaten tussah silk dossal as a supplemental option to the coronation tapestry dossal, and a financial gift in memory of Robert and Alice Hillis by their son, Robert, made it possible to remove our forty-year-old “temporary” altar and move the original marble altar away from the east wall to replace it. 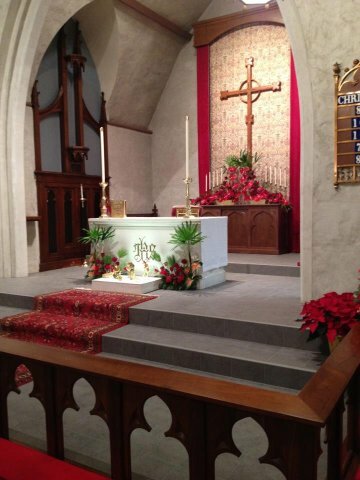 Gray tile replaced the carpet of the sanctuary, a table was positioned against the east wall for flowers, and red cushions softened the new tile at the communion rail.